This chapter reports on a small-scale cross-generational learning initiative instigated by a group of high school students in the historic city of Matsue in the western part of Japan, a region with a rapidly aging population. In this project, the students developed and organized a series of lessons to teach English to seniors in the community with the aim of providing English language guide services to international tourists visitors to the town. 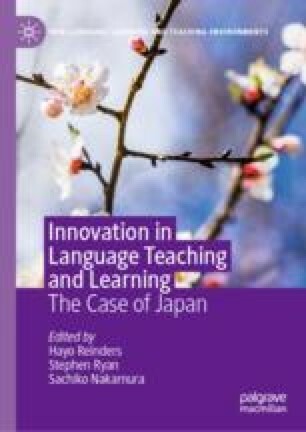 The chapter begins by considering some of the contextual factors that prompted this innovative approach to English learning, focusing on both demographic changes and the Japanese government’s ongoing attempts to reform education. In the subsequent section, we describe the process in which this innovation was developed by interpreting and sharing the stories told by the key players, and finally consider some of the wider implications and possibilities suggested by the project. Cabinet Office. (2017). Heisei 29-nendoban koreisyakai Hakusho (gaiyoban). Dai issho: Korei-ka no jokyo [2017 White paper on aging society, Chapter 1: The status report on aging]. Retrieved from http://www8.cao.go.jp/kourei/whitepaper/w-2017/html/gaiyou/s1_1.html. Increasing Inbound Tourism. (2018, January 16). Japan Times. Retrieved from https://www.japantimes.co.jp/opinion/2018/01/16/editorials/increasing-inbound-tourism/#.WpzUK4LLjMK. Koureishamuke eigo kyoshitu: Menba ga sasaeai chiiki eno omoi wo katachi ni shiteiku. [English language class for seniors: Members supporting each other to realize their concern for the local community] (2016, June). View 21, 28–31. Retrieved from http://berd.benesse.jp/magazine/kou/booklet/?id=4904. Matsue City. (2017). Matsue-shi Kanko Hakusho [Matsue City Tourism White paper]. Retrieved from http://www1.city.matsue.shimane.jp/shisei/keikaku/kankousinkoubu/kankou_hakusho/index.data/h28hakusho-honpen.pdf. Matsue Kita High School. http://www.matsuekita.ed.jp/. MEXT. (2002). Chapter 2 towards advancement of “academic ability”, Section 3. The new courses of study 1. In The new courses of study which aims to develop “academic ability”. Retrieved from http://www.mext.go.jp/b_menu/hakusho/html/hpac200201/hpac200201_2_015.html. MEXT. (2009). Kotogakko gakushu shido youryo kaisetu: Sogoteki na gakushu no jikan hen [Guide for the period of integrated study in high school course of study]. Retrieved from http://www.mext.go.jp/component/a_menu/education/micro_detail/__icsFiles/afieldfile/2010/01/29/1282000_19.pdf. MEXT. (2011). Courses of study: Chapter 5 the period for integrated studies. Retrieved from http://www.mext.go.jp/component/english/__icsFiles/afieldfile/2011/03/17/1303755_012.pdf. Ministry of Internal Affairs and Communication, Statistics Bureau. (2018, July 13). Japan statistical yearbook, chapter 2: Population and households. Retrieved from http://www.stat.go.jp/english/data/nenkan/67nenkan/1431-02.html. NIER. (2017). Heisei 29-nendo zentoku gakuryoku gakusyujyokyo chosa chosa kekka shiryo todofuken-betsu [The course-prefectoral results of the 2017 national assessment of academic ability]. Retrieved from http://www.nier.go.jp/17chousakekkahoukoku/factsheet/17prefecture-City/. Pearson Foundation. (2013). Strong performers and successful reformers in education. Retrieved from http://learningisopen.org/oecd/japan.html.